Surround sound is terrific. Untidy wires snaking from receiver to surround speakers? Not so much. Here are five tactics for a clean installation, starting with the simplest. Wireless surround sound systems are simple to set up and offer a lot of flexibility. 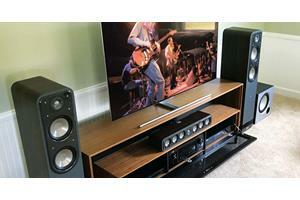 Choices range from compact front-speaker systems to full 7.1 home theater. 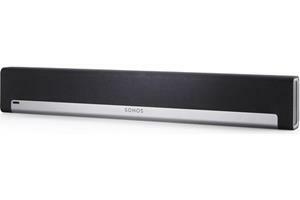 Our customers' most popular choice for wireless surround is the Sonos PLAYBAR. Use it by itself, or add two PLAY:1 speakers and the Sonos SUB for a complete wireless system. It’s an easy way to get 5.1 surround sound and room-filling music without the clutter of speaker wire. 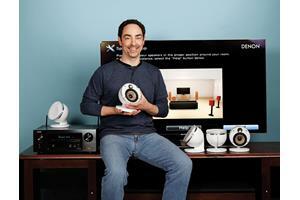 Do you already have surround speakers and a subwoofer? Use a wireless transmitter to avoid long cable and wire runs across the room. 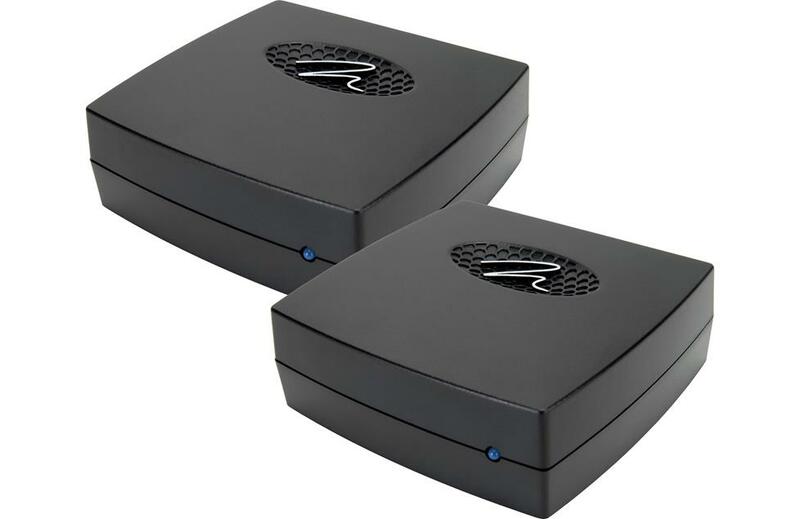 If your receiver has multi-channel RCA outputs, Audioengine makes it easy. Use their W3 wireless audio adapter kit to send surround information to the N22 amplifer. Want to eliminate the subwoofer cable? Use the Martin Logan SW2-TRD to get wireless bass. MartinLogan's SW2-TRD subwoofer adapter kit lets you add wireless connectivity to your powered sub. Want your wires totally hidden? Run in-wall speaker cable through your walls or ceiling for a stealthy installation. Wall plates make wire connections neat and clean if you’re using externally-mounted speakers. If you’re using recessed speakers, the wire is completely hidden away. See our comprehensive in-wall wiring guide for more info. 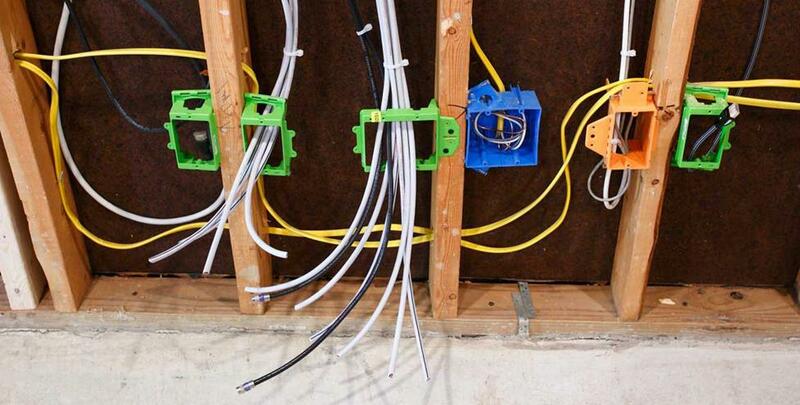 Use in-wall rated wiring for a clean, stealthy installation. 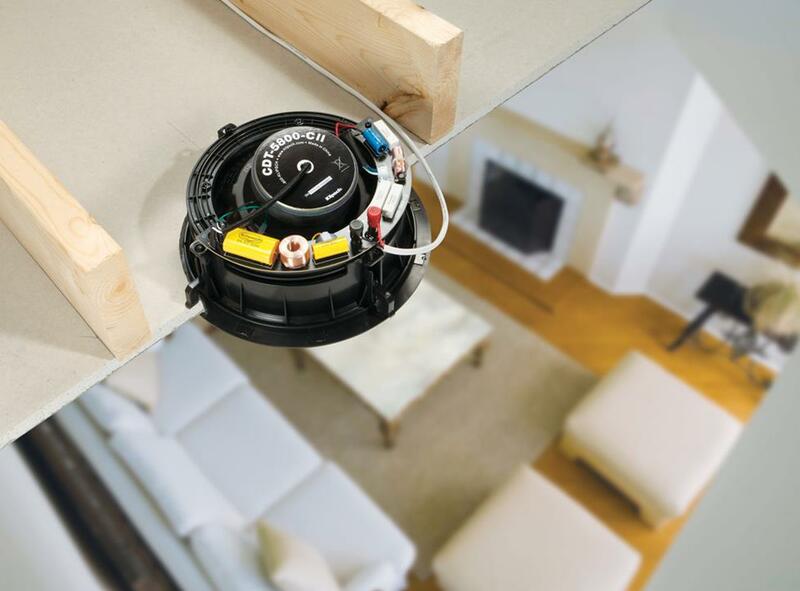 Do you have exposed wires and cables running down walls and along baseboards? Easily conceal them with paintable wire channels. We also offer an assortment of cable ties and wraps to keep things organized. Read our A/V cable management guide for more tips on keeping your system neat and clean. Install in-wall or ceiling speakers and enjoy surround effects with zero footprint. Some people use these for just their surround speakers. 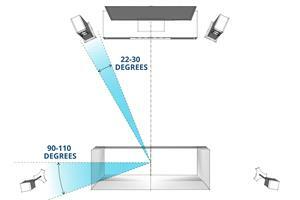 Others install in-wall or ceiling speakers in each location of their home theater. Recessed speakers do require more installation work. But they provide a smooth, finished look that sounds fantastic. Plus, they have paintable frames and grilles to match your décor. Read our ceiling and in-wall speaker buying guide for recommendations. In-ceiling speakers provide powerful overhead sound effects with zero footprint. A sound bar. Some even simulate surround sound without using rear speakers. 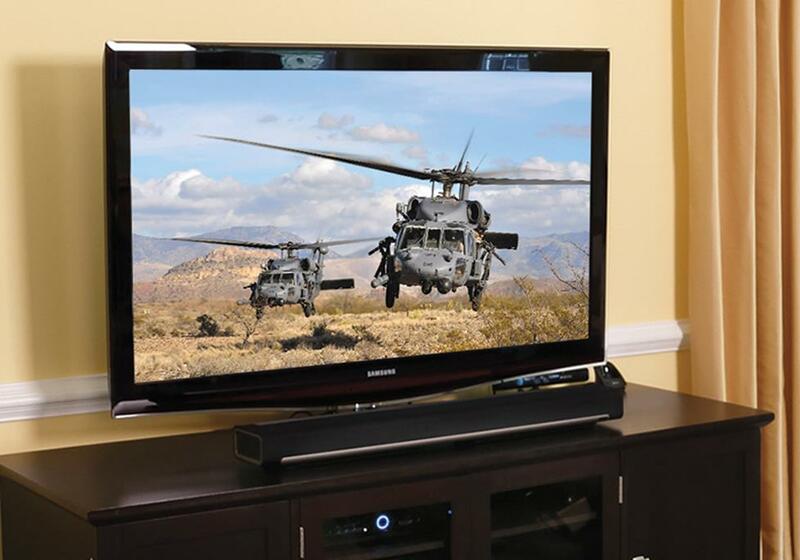 Read our sound bars buying guide to learn more. You can also achieve a powerful front sound stage by using separate speakers. A 2.1 system (a pair of speakers and a subwoofer) is a great option. Even better is a 3.1 setup (a 2.1 system that adds a center channel for improved dialogue). Check out this article to learn more. Use a soundbar and a sub in the front of your room for great dialogue and convincing sound effects. Want friendly, one-on-one help choosing the best gear for your new system? Our expert Advisors can help. Call or chat with us today for free, personalized advice. Free lifetime tech support is included with every Crutchfield purchase. Probably one of the most useless articles I've read in a long time. Let me try what you did. I can write a great advice article too. How to cook the most amazing thanksgiving meal all by yourself and impress your family. 1. Go to culinary school and become a professional chef 2. By a pre-cooked meal. Tell them you did it. 3. Does someone else in your family cook? Your spouse? Maybe they can do it? 4. Try eating salad and cheerios with some bread. 5. Screw it. Order a pizza instead. 6. Don't celebrate thanksgiving. Done. Hi Rudy, I'm sorry the article wasn't helpful for you. May I ask what you wanted to learn that wasn't offered in the content? We're always here to help by phone or chat too, if you'd like to talk about the specifics of your system. Hi Jeremy, I recommend giving one of our expert advisors a call. 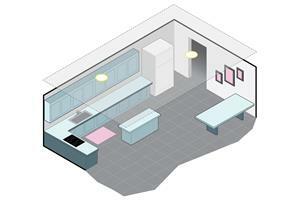 They can discuss the specifics of your system with you, and will help you find the best solution for your home. So buy a new system with wireless, or add wireless to your system, run wires (not an easy feet once walls are up), or don't have surround sound at all. Is this supposed to be a joke, anyone so clueless about surround sound where this advice would actually be useful, well they are likely here looking for assistance figuring out how to hook-up an HDMI cable from their cable box to the TV. I was looking for creative ways to incorporate rear surround speakers into a great room besides in-ceiling speakers (which due to being mounted in very dynamic conditions, don't sound as good as sealed speakers tuned for their enclosure). Hi Paul, feel free to give one of our expert Advisors a call. They can discuss the specifics of your system with you, and will help you find the best solution for your home. Room friendly ways to add surround sound speakers: 1. Buy a brand new system. 2. Use wireless transmitters, because plugging in expensive transmitters won't require any cables.....? 3. Run cables through your walls - because tearing out your walls just to run speaker wire will be easy and not cost you much....... /sarcasm. 4. Use in-wall or ceiling speakers...because that'll help me set up my current speakers. 5. Don't bother with surround! Wow, these sure are helpful. Your great setups must have never, ever involved having to deal with people who already have speaker systems and need assistance.